Studer Group® is a strong proponent of patient-centered care. Patient Call Manager: The Clinical Call System (PCM), is one of our most important tools for making patients an integral part of the collaborative care team. It is designed to extend care outside the hospital walls-both before patients enter your hospital or practice, and after they go home. 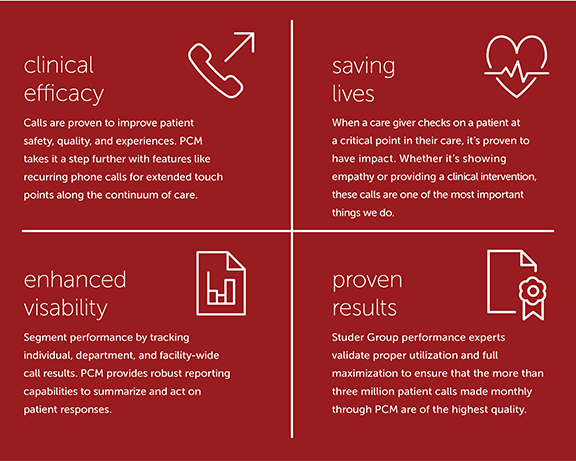 Patient Call Manager, when implemented in the context of Studer Group's coaching expertise, represents the next generation of care designed to provide touch points as a patient navigates your healthcare system. When we partner with organizations to install our clinical call system, we also send a performance expert to assist leadership in ensuring that callers are asking the right questions and that all features are being maximized to their best possible advantage. 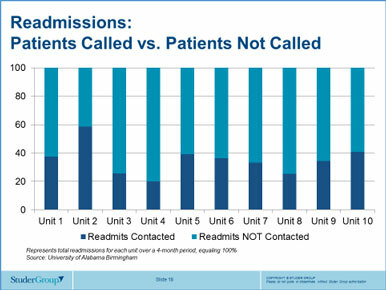 Studer Group is going beyond just the post-visit call, to determine the frequency of connection that will have the biggest impact on reducing readmissions, in addition to the impact individual questions have. 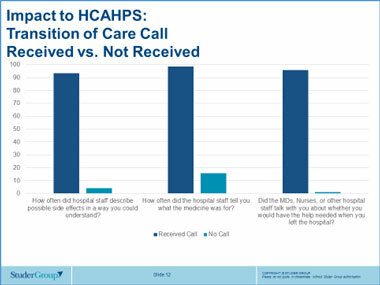 Through features like serial calls for high risk groups, and color borders that flag patients that have been in your organization within the past 30 days, you can quickly prioritize which patients need to stay connected with your care givers to ease transitions from your care to home. The data that demonstrates the correlation between evidence-based care, quality outcomes, patient experience and lower costs continues to mount. When one reviews the publicly reportable data, it is clear that better healthcare is less costly healthcare. Data also suggests a strong correlation between a patient's perception of care and actual clinical outcomes. Further, there is data that correlates specific questions like preparation for at-home care and the likelihood of readmission. Download the Patient Call ManagerSM product sheet to access full details. 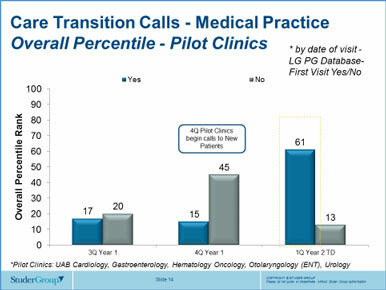 Patient Call ManagerSM sets organizations up to improve the clinical quality of care. Are you ready? Complete the form to get started today.